By Babatis Banda: It is disheartening to see one of the biggest fights in boxing never take place due to a promoter. First, Bob Arum has been preoccupied in making Floyd Mayweather Jr. look bad, than a real effort towards making the biggest fight happen. Now, we are told that Arum says Manny Pacquiao will face Juan Manuel Marquez for the fourth time before he can fight Floyd. What comes in my mind is; what is Pacquiao going to prove in a fourth fight that he couldn’t in three? Why can’t Pacquiao have the fourth grudge match with Marquez after Floyd? Simple logic will tell you that Arum and Freddy Roach have been cleverly getting the best out of Manny while it lasted. A fight with Floyd would definitively end the Manny era and Arum and Roach understands this very well. Roach and Arum have marketed and made millions out of the Pacman, it would be stupid to let the cash cow go without ensuring that no more milk can be milked. By the time Roach and Arum are done with the Pacman, he will just be a shell of himself with just a name from his past. We have seen this before, and it is not strange. Now all we are hearing are excuses that Manny has too much on his hands. The fact is that, if there is any boxer that usually has too much in his hands, it is Floyd. Floyd creates his own web, entangle himself in it, but he always has a way out. Floyd has come out of long lay-offs and has picked strong opposition and destroyed it. We do not need any roadblocks to this fight any more. True lovers of the sport should object Arums decision of having a fourth Marquez/Manny fight, barely minutes after their third grudge match which Manny couldn’t account himself any better than the first two. Manny is not distracted in anyway, he has not changed in anyway, that is the real Manny when he faces somebody who thinks in the ring. 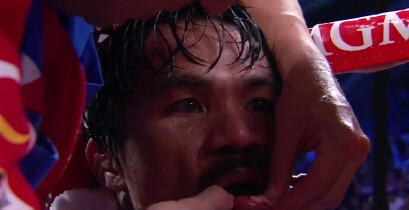 I can’t see Manny throwing a thousand punches against Floyd because the pay-back would be unbearable for him. We saw Manny check his aggression when Marques was nailing him with hard rights, right on the button. Floyd would do that over and over until he is red faced. Without having to become a philosopher, it is easy to see why Manny has never pushed hard for a fight against Floyd, he always remains in the back-ground and plays the good fellow. That performance we saw against Marquez would be pure suicide against the vexed Floyd Mayweather junior, and it explains the difficulty of this fight ever being made. Arum however, should never ever get away with it, and he will frantically try to make the fight when he knows that Manny has no more to offer.